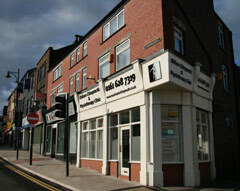 The clinic can be seen from the Oldham Mumps tram stop and is a two minutes walk up Prince Street towards the town centre. At the junction at the top of Prince Street you will be directly facing the clinic. From M62 – Come off at Junction 20 towards Rochdale/Oldham and it is about a 10 minutes drive to the clinic. At the Roundabout take the 3rd exit onto the A627(M) towards Oldham and take the A627/A663 exit towards Oldham/Royton/Shaw. At the roundabout, take the 2nd exit onto Chadderton Way/A627. Follow the road and at roundabout, take the 3rd exit onto Oldham Way/A627, this takes you onto a dual carriageway. At the first set of traffic lights turn left towards the town centre and at the next set of lights you will be facing the clinic. Parking can be found behind the clinic, or on Yorkshire Street and Union Street. From M60 – Come off at Junction 22 (Oldham) and it is about a 10 minutes drive to the clinic. Follow the A62 towards Oldham/Huddersfield. At the first roundabout follow signs for the A627 towards Huddersfield and this takes you onto a dual carriageway. At the first set of traffic lights turn left towards the town centre and at the next set of lights you will be facing the clinic. Parking can be found behind the clinic, or on Yorkshire Street and Union Street. Please beware the ongoing roadworks due to the Metrolink. Try to avoid using Union Street and Yorkshire Street if possible as there can be considerable disruption. If possible, use the A627 (Huddersfield Road and Oldham Way) and come up the new link-road (Prince Street) and come up Beever Street. Alternatively use the back-roads and come down Rock Street and Beever Street that way. The closest bus stops to the clinic are on Union Street outside the Link Centre and this is served by Bus Routes 58, 59, 81a, 83, 180, 184 and 350. There is also a bus stop 50 yards up from the clinic towards the bottom of Yorkshire Street outside Mario’s Restaurant. This is served by Bus Routes 58, 59, 81, 81a, 82, 83, 180, 184, 343, 344, 350, 400, 407, 418 and 425. Civic Centre bus terminus: Approximately 15 minutes walk to the clinic.